EVP, what is it? find a full explanation right here! Electronic voice phenomena also known as EVP, is electronically generated noises that many believe to be speech, but are not the result of intentional voice recordings. Common sources of EVP include static, stray radio transmissions, and background noise. Some have claimed these sounds are of a paranormal origin, while there are natural explanations such as apophenia, which is finding significance in insignificant phenomena, auditory pareidolia, which is were someone will interpret random sounds as voices in their own language, or just simple hoaxes. Recordings of white noise are often created from background sound by increasing the volume or sensitivity of the recording equipment. Many parapsychologists, such as Konstantin Raudive who is highly respected in this field, claim that most evp is of a single word or short sentence. To put it simply, no, no it is not dangerous, it is merely sound, quite often sound that you wont be able to hear without modifying in some way. It isn't physical and cant cause any harm, the only thing it can do though is cause fear, especially if you've looked round a location with a recorder on, seen nothing and got home only to find a voice saying "get out". As the spiritualism religious movement became prominent in the 1840s–1920s with a distinguishing belief that the spirits of the dead can be contacted by mediums, new technologies of the era including photography were employed by spiritualists in an effort to demonstrate contact with a Spirit world. So popular were such ideas that Thomas Edison was asked in an interview with Scientific American to comment on the possibility of using his inventions to communicate with spirits. He said that if the spirits were only capable of subtle influences, a sensitive recording device would provide a better chance of spirit communication than the table tipping and ouija boards mediums employed at the time. However, there is no indication that Edison ever designed or constructed a device for such a purpose. As sound recording became widespread, mediums explored using this technology to demonstrate communication with the dead as well. Spiritualism declined in the latter part of the 20th century, but attempts to use portable recording devices and modern digital technologies to communicate with spirits continued. American photographer Attila von Szalay was among the first to try recording what he believed to be voices of the dead as a way to compliment his investigations in photographing ghosts. He began his attempts in 1941 using a 78 rpm record, but it wasn't until 1956, after switching to a reel-to-reel tape recorder, that he believed he had been successful. Working with Raymond Bayless, von Szalay conducted a number of recording sessions with a custom-made apparatus, consisting of a microphone in an insulated cabinet connected to an external recording device and speaker. Szalay reported finding many sounds on the tape that could not be heard on the speaker at the time of recording, some of which were recorded when there was no one in the cabinet. He believed these sounds to be the voices of spirits. Among the first recordings believed to be spirit voices were such messages as "This is G! ", "Hot dog, Art! ", and "Merry Christmas and Happy New Year to you all". Von Szalay and Bayless' work was published by the Journal of the American Society for Psychical Research in 1959. Bayless later went on to co-author the 1979 book, Phone Calls From the Dead. Konstantin Raudive, a Latvian psychologist who had taught at the University of Uppsala, Sweden and who had worked in conjunction with Jürgenson, made over 100,000 recordings which he described as being communications with dead people. Some of these recordings were conducted in an RF-screened laboratory and contained words Raudive said were identifiable. In an attempt to confirm the content of his recordings, Raudive invited listeners to hear and interpret them. He believed that the clarity of the voices heard in his recordings implied that they could not be readily explained by normal means. Raudive published his first book, Breakthrough: An Amazing Experiment in Electronic Communication with the Dead in 1968 and it was translated into English in 1971. In 1980, William O'Neil constructed an electronic audio device called "The Spiricom." O'Neil claimed the device was built to specifications which he received psychically from George Mueller, a scientist who had died six years previously. At a Washington, DC, press conference on April 6, 1982, O'Neil stated that he was able to hold two-way conversations with spirits through the Spiricom device, and provided the design specifications to researchers for free. However, nobody is known to have replicated O'Neil's results using their own Spiricom devices. O'Neil's partner, retired industrialist George Meek, attributed O'Neil's success, and the inability of others to replicate it, to O'Neil's mediumistic abilities forming part of the loop that made the system work. However, there is strong evidence to suggest that the recordings of conversations were falsified by O'Neil, specifically with an electrolarynx. The clearly audible vocal fricatives in the recordings, along with the fact that during the hours of recordings O'Neil's and Mueller's voices never overlap (as would happen in normal conversation), support this theory. Instrumental Trans-Communication (ITC) attempt during a 2008 paranormal investigation at the Idaho State Penitentiary. In 1982, Sarah Estep founded the American Association of Electronic Voice Phenomena (AA-EVP) in Severna park, Maryland, a nonprofit organization with the purpose of increasing awareness of EVP, and of teaching standardized methods for capturing it. Estep began her exploration of EVP in 1976, and says she has made hundreds of recordings of messages from deceased friends, relatives, and other individuals, including Konstantin Raudive, Beethoven, a lamplighter from 18th century Philadelphia, Pennsylvania, and extraterrestrials whom she speculated originated from other planets or dimensions. The term Instrumental Trans-Communication (ITC) was coined by Ernst Senkowski in the 1970s to refer more generally to communication through any sort of electronic device such as tape recorders, fax machines, television sets or computers between spirits or other discarnate entities and the living. One particularly famous claimed incidence of ITC occurred when the image of EVP enthusiast Friedrich Jürgenson (whose funeral was held that day) was said to have appeared on a television in the home of a colleague, which had been purposefully tuned to a vacant channel. ITC enthusiasts also look at TV and video camera feedback loop of the Droste effect. In 1997, Imants Barušs, of the Department of Psychology at the University of Western Ontario, conducted a series of experiments using the methods of white noise investigator Konstantin Raudive, and the work of "instrumental trans-communication researcher" Mark Macy, as a guide. A radio was tuned to an empty frequency, and over 81 sessions a total of 60 hours and 11 minutes of recordings were collected. During recordings, a person either sat in silence or attempted to make verbal contact with potential sources of white noise. Barušs stated that he did record several events that sounded like voices, but they were too few and too random to represent viable data and too open to interpretation to be described definitively as EVP. He concluded: "While we did replicate EVP in the weak sense of finding voices on audio tapes, none of the phenomena found in our study was clearly anomalous, let alone attributable to discarnate beings. Hence we have failed to replicate EVP in the strong sense." The findings were published in the journal of scientific exploration in 2001, and include a literature review.In 2005, the Journal of the society for psychical research published a report by paranormal investigator Alexander MacRae. MacRae conducted recording sessions using a device of his own design that generated EVP. In an attempt to demonstrate that different individuals would interpret EVP in the recordings the same way, MacRae asked seven people to compare some selections to a list of five phrases he provided, and to choose the best match. MacRae said the results of the listening panels indicated that the selections were of paranormal origin. Portable digital voice recorders are currently the technology of choice for EVP investigators. Since these devices are very susceptible to Radio Frequency (RF) contamination, EVP enthusiasts sometimes try to record EVP in RF- and sound-screened rooms. Nevertheless, in order to record EVP there has to be noise in the audio circuits of the device used to produce the EVP. For this reason, those who attempt to record EVP often use two recorders that have differing quality audio circuitry and rely on noise heard from the poorer quality instrument to generate EVP. Some EVP enthusiasts describe hearing the words in EVP as an ability, much like learning a new language. Skeptics say that the claimed instances are all either hoaxes or misinterpretations of natural phenomena. EVP and ITC are seldom researched within the scientific community and, as ideas, are generally derided by scientists when asked. Most explanations of EVP can be categorised as either paranormal, explaining the source of the voice, or non-paranormal. Explanations of the latter kind usually posit (except in the case of hoaxes) that there is actually no 'voice' at all, merely the illusion of a voice due to various effects. However, often people interpret the sounds as voices because it is what they want to hear, so the noises created are thought to be of what the person would like it to be instead of what it actually is, for this reason claims of recorded evp are massively higher than identifiable recordings. Skeptics such as Chris French, Terrence Hines and Michael Shermer say that EVP are usually recorded by raising the "noise floor" - the electrical noise created by all electrical devices - in order to create white noise. When this noise is filtered, it can be made to produce noises which sound like speech. Federlein says that this is no different from using a wah pedal on a guitar, which is a focused sweep filter which moves around the spectrum and creates open vowel sounds. This, according to Federlein, sounds exactly like some EVP. This, in combination with such things as cross modulation of radio stations or faulty ground loops can cause the impression of paranormal voices. The human brain evolved to recognize patterns, and if a person listens to enough noise the brain will detect words, even when there is no intelligent source for them. Expectation also plays an important part in making people believe they are hearing voices in random noise. Apophenia is related to, but distinct from pareidolia. Apophenia is defined as "the spontaneous finding of connections or meaning in things which are random, unconnected or meaningless", and has been put forward as a possible explanation. Interference, for example, is seen in certain EVP recordings, especially those recorded on devices which contain RLC circuitry. These cases represent radio signals of voices or other sounds from broadcast sources. Interference from CB Radio transmissions and wireless baby monitors, or anomalies generated though cross modulation from other electronic devices, are all documented phenomena. It is even possible for circuits to resonate without any internal power source by means of radio reception. 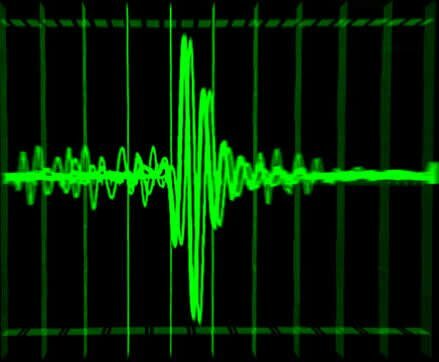 Capture errors are anomalies created by the method used to capture audio signals, such as noise generated through the over-amplification of a signal at the point of recording.Artifacts created during attempts to boost the clarity of an existing recording might explain some EVP. Methods include re-sampling, frequency isolation, and noise reduction or enhancement, which can cause recordings to take on qualities significantly different from those that were present in the original recording. The very first white noise recordings may have originated from the use of tape recording equipment with poorly aligned erasure and recording heads, resulting in previous audio recordings not being completely erased. This could allow a small percentage of previous content to be superimposed or mixed into a new 'silent' recording. There are a number of organizations dedicated to studying white noise and instrumental trans-communication. Individuals within these organizations may participate in investigations, author books or journal articles, deliver presentations, and hold conferences where they share experiences. In addition organizations exist which dispute the validity of the phenomena on scientific grounds.It seems that neither way will be able to be proved in the near future, so the debate will rage on.